What the Fava! The Broad bean glut is on. One week they look nice and petite, ready to be eaten raw with a chunk of Pecorino cheese. Blink, turn around, and suddenly they are huge and in plague proportions. Broad Beans or Fave have a fascinating history but none more so than for our local Italo- Australiani, many of whom migrated here in the 1950s, with broad beans sewn into the lining of their suitcases or hems of their coats. Fava beans played a important role in the Sicilian tradition. When dried, roasted and blessed, they became lucky beans. Some believe that if you keep one in the pantry, there will always be food in the kitchen. Given the size of our broad bean crop, we will be very fortunati this month. I collected another basket load today and enlisted the help of young chef Daisy, who was happy to shell them for our lunch. 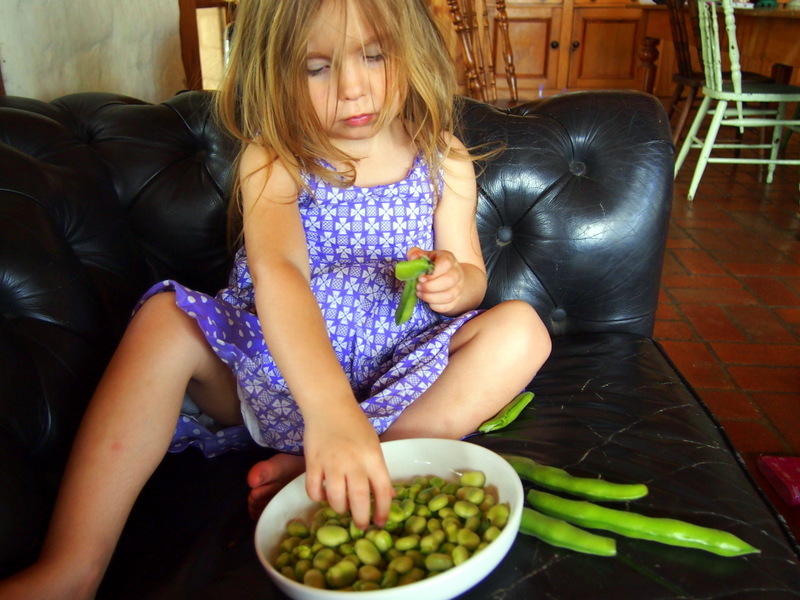 Today’s recipe is an old favourite, using bits and pieces from the garden- broad beans, dill, and spring onions. It serves four, or three very greedy people, and is quick to prepare, once the beans are shelled, cooked, then peeled ( the only tedious part). Shell the beans. Bring a pot of water to the boil, then add beans, bring back to the boil then cook for a minute or so. Drain, refresh with running cold water, and slip them out of their skins. In a large, heavy based pan, melt the better and add the chopped spring onions. Cook these for a few minutes, then add the wine. Reduce down to 2 tablespoons. Then add the creme fraiche or cream, lower heat and allow the mixture to thicken. Bring a large pot of water to the boil and add salt. Cook the Tagliatelle for the required time. Before draining, scoop out one cup of the pasta cooking water. ( a good general habit). If the cream sauce seems thick and needs loosening, add a little pasta water, Season. Then stir through the broad beans and cut salmon bits. ( the salmon needs warming, not cooking) Add the drained pasta to the pan, toss about, adding the dill at this point. Serve in heated pasta bowls. Next Next post: Lentil Bolognese. Pasta Comfort food.